Nice story IrishGunner. This is a clean example why we preserve history. Sometimes we collectors as keepsakers of history do the right thing, because it's just that, the right thing. I agree, the Belgian option is more realistic. It is a put together. Let's revive this old topic. @SGM97B, well done. Indeed you are one of the few US miltary to participate and succeed. I enclose a picture of one of my favorite medal sets. 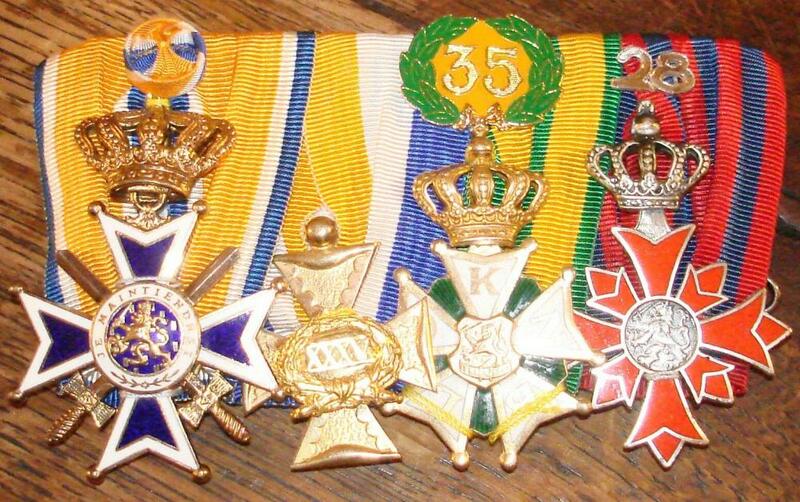 This set is from a Dutch Colonel who was the first to reach 25 succesfull participations. At this moment only ten people succeeded to reach this number and qualified for the red enamelled cross. Some sort of an award medal of the American Legion, a US veteran organisation. On the US Militaria Forum you can find a big variéty of medals this organisation issued over the years. 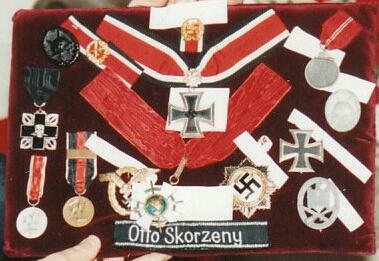 It seems that Otto Skorzeny was awarded a Commanders grade of this Order for his action late 1944. His awards which were at his funeral in 1975 shows this Order. It's a well worn example. Thanks Bill for the effort and the information. Laurentius is correct. It's the first type that existed till 1910ish. Your example isn't numbered. This ia always the case I think with original issued ones. What I meant to say was that they only used this ribbon and put a Czech officer grade attachment on top. I did not mean to say that this Belgian officer served on a Danish hospitalship or in a Danish unit. Just that the medal mounted used some different ribbon which looked close enough to use it. I checked my pictures and the Internet, but nothing similar in the Belgian medals. 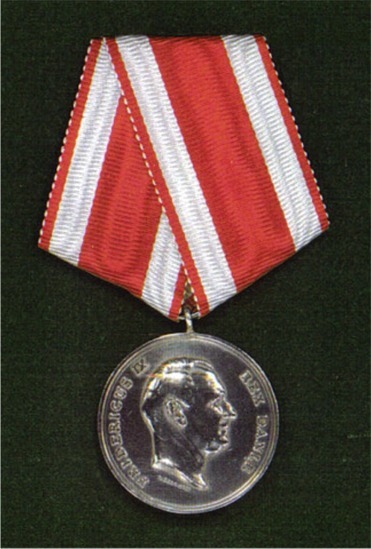 Even the Belgian Red Cross medals do not have a match with this typical red and white variation. However I did find a match for the ribbon. 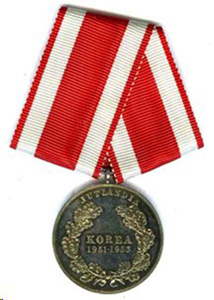 It's an unexpected one but the ribbon of the Danish Korea medal is a match. Well, then somebody used that Belgian ribbon to create a Czech White Lion on this ribbonbar. A nice collection you bought. Only the medals with the full orange colour are Dutch. They are called the 'Trouwe dienst medaille' Loyal service medal. 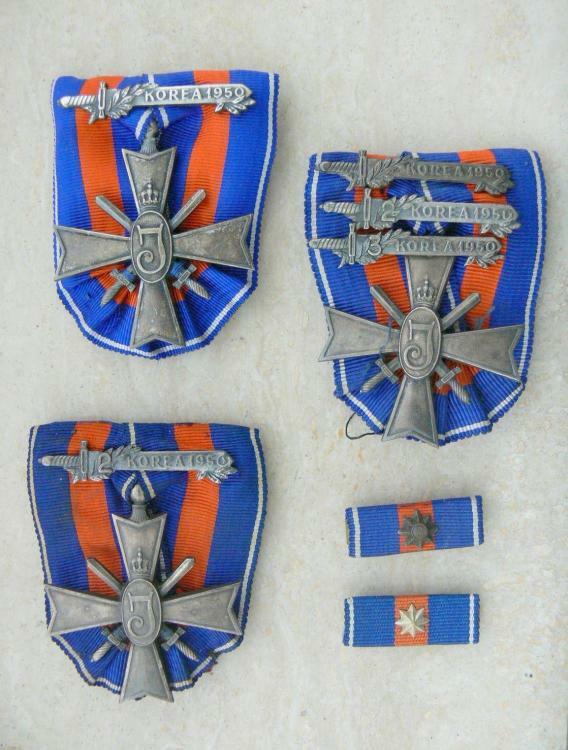 It is given to all Dutch military personell below the rank of officer. A bronze one is given for 12 years of service, a silver one for 24 years and a gold one for 36 years. 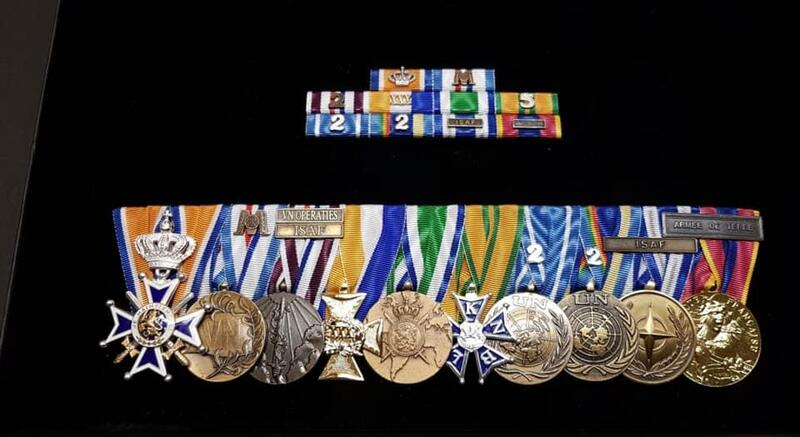 The left one on the last picture is a Korean miniature medal for the Korean war given to military personell who served in the Korean war from 1950 - 1954.